Shiv Jayanti was celebrated with great fervor, and Belagavi is known for its unique traditions and celebrations of Chatrapati Shivaji Maharaj. Tributes were paid to the warrior king Chatrapati Shivaji Maharaj and huge number of people gathered to witness the grand procession. Thousands of people from all walks of life thronged the streets and all vantage points were occupied to get the perfect view. This year due to the election code of conduct procession was held on May 19. The procession which began from Nargundkar Bhave chowk reached its last point the Kapileshwar Temple in the wee hours of the morning. 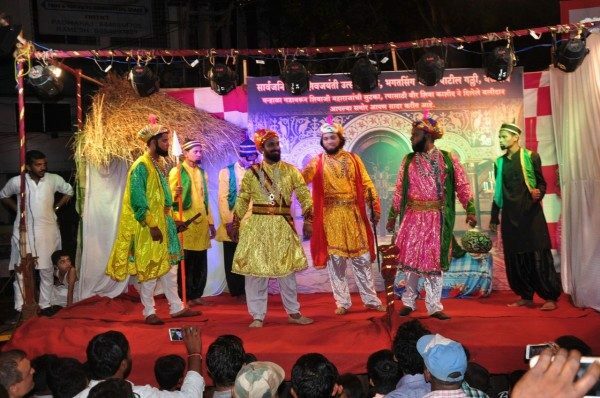 The decorated tableaus from different Galli’s and areas of the city, showcased posters and skits recalling the historical incidents of Shivaji. Dying performing arts such as Lathi (stick) fighting skills, sword fights, fire ball string skills, Lazim dance, Karela skills, playing of Zhanz Pathak and more along the procession was an added attraction.